Just in case the news relating to Playtonic's début didn't get the Rare fans among you excited enough, we've got a little update on what another group of famous ex-Rare developers have been up to since leaving the legendary UK studio - and it's probably not what you were expecting. Preciousbluedot is a company which creates apps for the financial services sector, and was established in 2010 by Mark Betteridge and Lee Musgrave. If you know your Rare history then both of those names should have triggered a huge surge of interest - Betteridge joined the Twycross-based developer in the very early days to work on titles like Snake, Rattle 'n' Roll, Cobra Triangle, Battletoads and Killer Instinct, and prior to leaving the company was employed as its Creative Director. Lee Musgrave worked on titles like Jet Force Gemini, Mickey's Speedway USA and Diddy Kong Racing, as well as the aborted Donkey Kong Racing. 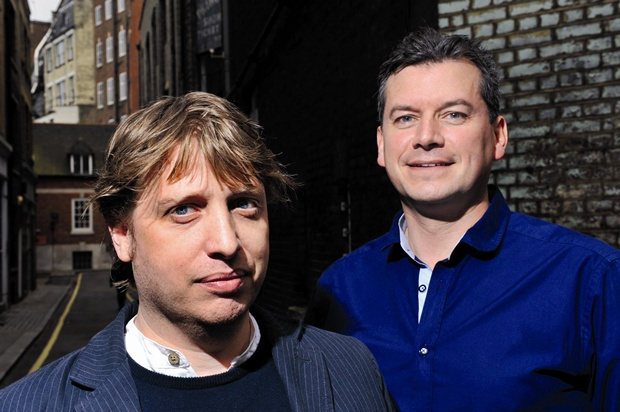 Since setting up the firm, the duo have attracted other Rare alumni, including Brendan Gunn (Donkey Kong Country series) and Nic Makin (Perfect Dark Zero and Kameo). As if to make the connection even more obvious, Preciousbluedot's offices are just a short walk from the tiny Ashby-de-la-Zouch shop above which Rare founders Tim and Chris Stamper set up Ashby Computers & Graphics - the firm would morph into Ultimate Play the Game and eventually Rare. In the professional world you will suffer a Bloomberg terminal, even though it is horrid to use, because it is your job. As soon as you go to the general public, it has to be intuitive and engaging. That is in our background from gaming. The real impact of computers and fixed units disappearing and tablets becoming all you have is not really felt yet. Your phone or tablet will become your phone, wallet and PC all in one. The big thing will be making the information financial services give us through those apps more relevant. Making the data more intuitive and more relevant to them will be huge. Lists of numbers do not mean much to people. The power of compound interest is so much clearer when it is illustrated. It is difficult to envisage, even for a technical person. The way to make it understandable is to present it in a way people can understand using technology. Some of the tools around planning are quite clunky. There are a lot of pieces of software that have been developed on PCs around different parts of the chain, some concerning tax planning, some regarding inheritance and so on. They are all disparate pieces of software. Overhauling that in a graphical way would be useful to a lot of people. If you could make things connected, see where you come from and where you're going to, people will enjoy it. Also, practically it makes the processes much easier to manage. Pensions are ripe for an overhaul. People don't see their pension as their second biggest asset, or work out the benefit of having it. The house is different because it is tangible. Helping people visualise their pension would make people more conscious of it. While none of this is directly related to gaming, it's nonetheless interesting to see how a team of veteran designers can apply the things they have learned from video games to totally different sector. Well that's different I guess. Does anyone know what the founders, Chris and Tim Stamper are doing nowadays? @Luffymcduck Tim has founded a new smartphone game studio called FortuneFish with his son. Not sure what Chris is up to! "Helping people visualise their pension would make people more conscious of it." I learned all about compund interest and how to calculate it. Graphics are far easier and quicker. This will be a great tool for those who need it. Since we're on the the topic, I think it's worth noting that many Americans are no longer getting a proper pension, if any, or their pension is being severely reduced. This is happening because elite corporate interests have weakened our laws and retirement capabilities for non-private arrangements. We have been duped into the 401k model of retirement planning. Perhaps if apps like this became more widespread, and people could be plainly shown what is happening on both a personal and a national scale, especially compared to other nations, perhaps Americans as a whole would be more assertive in reclaiming their pension rights. Sounds very boring, and in the stinking, rotting financial sector no less!! A well, I wish them the best of luck! They should base their pension financial software on the game Snakes and Ladders. As you would know, the more ladders you climb, the more snakes you are likely to run into. Eventually you will end up on the bottom rung. A board game like snakes and ladders mimics the maze of bureaucratic regulations needing to be worked through to get a pension. Perhaps they should put a help desk on one of the squares, and hope you don't get a snake charmer on the other end of the line.